The Three Blackbirds, Broad Street, Ely, Cambs. UK. Walk up to the side of the Cutter Inn and follow the path straight ahead until you reach the old house at the end called THE THREE BLACKBIRDS. 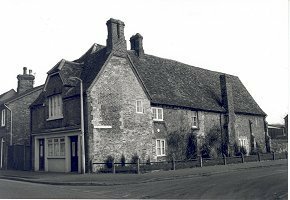 This is a listed building constructed towards the end of the 13th century and considerably altered in the first half of the 14th century. Originally a merchant's house, there was an opening in the lower hall that was used for handling money with the least risk of being robbed. It was later a public house and is one of the earlier secular buildings in the district. Turn right into Broad Street and cross the road. A gateway on the left leads into Cherry Park and monastic buildings.